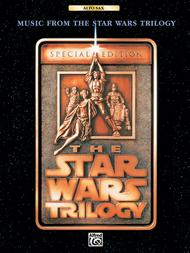 Music From The Star Wars Trilogy - Special Edition / Alto Sax (Alto Sax). Composed by John Williams. For solo alto saxophone. Instrumental Series. Movies. Difficulty: medium. Instrumental solo songbook (no accompaniment). Black & white photos. 20 pages. Published by Alfred Music (AP.0015B).ISBN 0769200109. With black & white photos. Movies. 9x12 inches.Titles are: Ben's Death/Tie Fighter Attack * Cantina Band * The Emperor Arrives * Han Solo and the Princess * The Imperial March * Jedi Rocks * Luke and Leia * May the Force Be with You * Parade of the Ewoks * Princess Leia's Theme * Star Wars (Main Theme) * The Throne Room * Victory Celebration * Yoda's Theme. Compatible instrument books, solo or mix-and-match. Available for: Flute, Clarinet, Alto Sax, Tenor Sax, Trumpet, Trombone, and Violin.